My husband told me his mother, an Italian American, used to fried some dough as snack, like this fried ricotta pasta. It reminds me pretty much of Indian puri (puffed flat bread), with the same crispy skin outside and tender chewy crumb inside. And today I also wanted something a bit spicy and tangy; I went trying Indira's red bell pepper chutney, which I found made a great dip for this fried pasta. I'd recommend you going to Indira's blog to look at her original chutney, the color and texture are excellent! In a bowl, mix ricotta, yolk, salt and pepper. Add a bit of milk to thin it out. Combine the flour with the ricotta mixture, add more milk (little by little) if necessary until a dough is formed. Divide the dough to small balls (6 to 8 pieces), flour the work table, and roll the ball to a 2mm-thick flat dough. If the dough resists to spread, rest it for 5 minutes (covered) then continue rolling. Pre-heat some oil (about 5 - 6 cm deep), fried the dough over medium/medium-high heat until it turns golden brown. 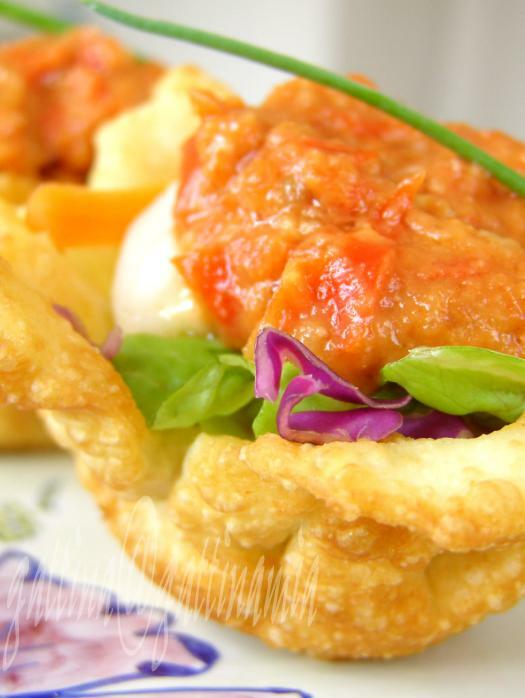 If you like to make this fried ricotta salad "bowl", roll the dough as thin (but manageable) as possible. Cut out a small piece of dough and drap it into a mini sieve (the one with a long handle), place another sieve on top of the dough, then go deep-frying. 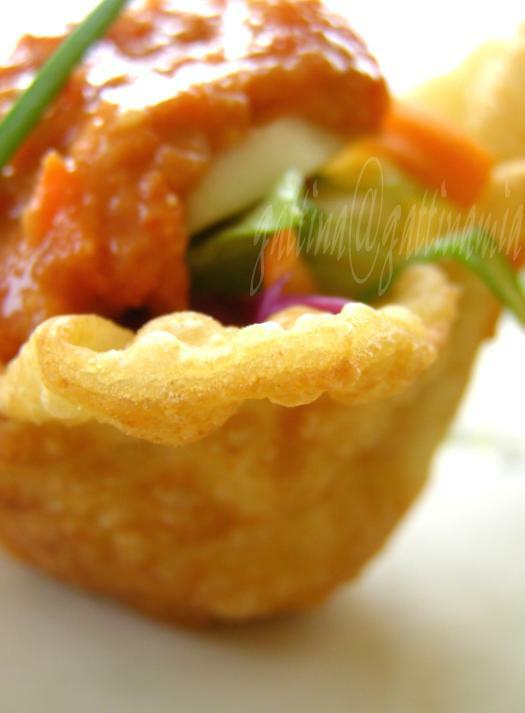 After the "bowl" is fried and cooled, fill it with salad and chutney. Gattina, this is lovely, once again. I always like your food bowls. Thats really a delicious dish.I like it. Oh wow ! They do look like puris. Chutney looks good too. Nice photos as usual Gattina, i liked the first photo the most, that purple shred of cabbage enhance all the other colors in the pic. Good job!!!! Gattina, very beautiful & professional photos as usual! Lovely blog! 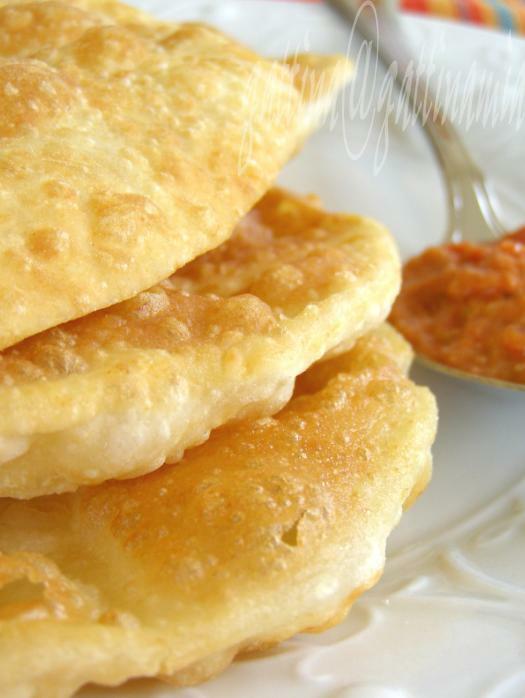 krithika, I think so, this fried dough and puri look the same. Archanat, thanks for your kind words. That shot is one of my very few ones has so many colors (not feeling too comfortable... just my taste), but will keep trying, seems the result quite ok.
Angie, what a surprise *waiting a handkerchief* Have any chance to taste the local cookies and pastries? When you stay in London, I bet you'll cry for Asian food! So where are you now?